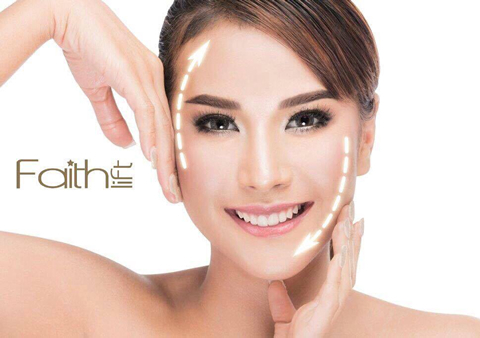 Faith Lift The Complete Non-Surgical Face Lifting Skincare System. Beginner Course: for those without facial qualifications. Conversion: for those with facial qualifications. A kit is required for these courses. Tibby Olivier presents Faith Lift, a non-surgical face lifting skin care system. The system consists of a Faith Lift Mask, Faith Lift Eye cream, Faith Lift Lip cream and Faith Lift Cream. Below is further information on each of the products. Faith Lift Mask is a naturally derived, skin tightening mask that will help to physically lift sagging skin, reducing the appearance of lines and wrinkles. When Faith Lift Mask is applied to the skin it forms an elegant film that will tighten and smooth the skin. This gentle sensation of smooth skin will last for hours, in some cases days, without the skin flaking or leaving it overtly tight. Best of all Faith Lift Mask is totally safe and non-invasive. Faith Lift Eye cream has the faith lift herbal extract in a rich emollient base that is specifically designed for use around the eyes; to rehydrate and provide essential nutrients for healthy skin. It has an instant effect like the mask. Faith Lift Lip is effectively a Hyaluronic acid based fractionated active that is able to penetrate the epidermis. This active is primarily used in products meant for use on the lips. Lip fullness is a sign of beauty and youthfulness. Faith Lift Lip plumps, redefines and minimizes fine vertical lines and keeps lip contour in shape, providing a more youthful and appealing look. It also includes a rich blend of oils, butters and waxes with Vitamin E to nourish and protect lips from harsh environmental conditions. This product needs to be used daily for at least 30 days for maximum effect. Faith Lift Cream contains the faith lift ingredient in a vitamin-rich, nourishing moisturiser containing Organic Shea Butter, Borage Oil, Organic Whole leaf Aloe Vera, Vitamin E and Vitamin A Palmitate. Creams can be worn under make-up as they have a matt finish.